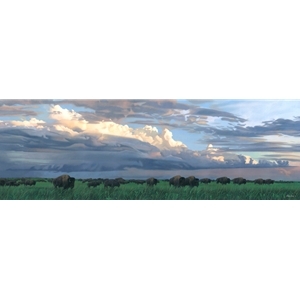 Prairie Thunder by Joshua Spies available from Prickly Pear Galleries. From the cave drawings of early man to Native American petroglyphs to the celebrated paintings of Catlin, McCarthy and Bama, the buffalo has long represented the freedom and possibility of our beautiful country. After a close brush with extinction, these noble animals have made an astonishing comeback, and the majestic sight of a herd of buffalo can once again lift the spirits of a weary cross-country traveler. The excitement of the wilderness comes to life in Joshua Spies’ Prairie Thunder. An event of epic proportions, the bulk of this massive herd comes rolling across the plains like an afternoon thundercloud. Spies, a native of South Dakota, has traveled the world in search of animals to paint but it is here, in the great open sky of the West, that his love of wildlife and skill with the brush shines brightest.